Welcome to Vancouver's Best Homes featured property listings by Dale McGauran and Dan Pigott, your Vancouver downtown and Northshore REALTOR® specialists. Browse our real estate listings currently for sale below in Vancouver, North Vancouver and West Vancouver, or you can view Our Recent Sales to see our portfolio of recently SOLD homes for our clients, or go to our Google Map Search to search all homes currently for sale on the MLS®. ICONIC MONTREUX in False Creek offering an urban eclectic live/work lifestyle! Walker’s, Biker’s and Transit Paradise! 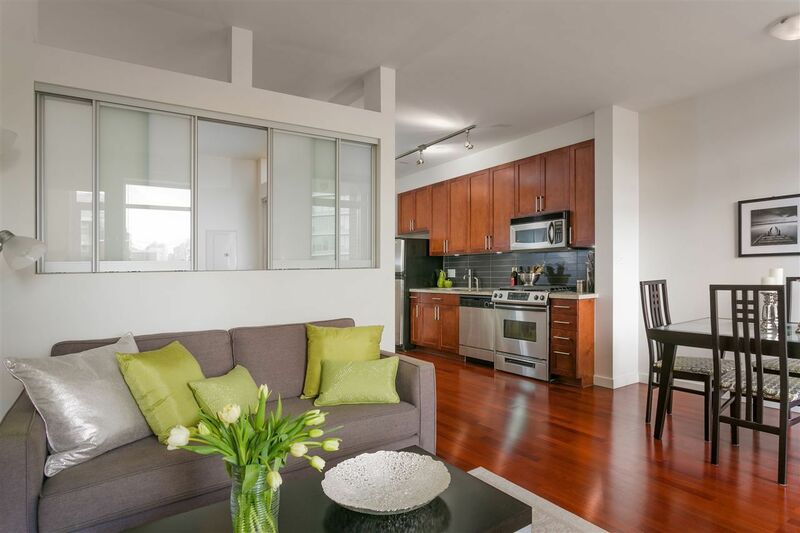 This 751sqft one bed condo includes a solarium/den, separated flex space with windows (large enough to be 2nd bedroom), in-suite storage room and a balcony. Options galore in this open concept living/dining room with featured fireplace and custom built-ins for tv/electronics and a master bedroom with the flexibility of glass sliders! This trendy pad includes hardwood floors and a galley kitchen with shaker cabinets, granite counter tops, s/s appliances and gas range. Located between vibrant Olympic Village and Cambie/Broadway, steps to the Canada Line, seawall, Whole Foods, restaurants, cafes, breweries – you name it and we have it. Parking and Pets. LOVE IT OR RENT IT!